Randomness is a DM’s best friend when filling out the details of your adventures, but good randomness requires smart prep. The material for this article was originally part of a presentation I made back in 2006, at a convention panel on Dungeon Master advice. Given the number of random tables that found their way into the fifth edition Dungeon Master’s Guide, it felt like a great topic to go back to for this installment of Behind the Screens. Randomness is one of the best tools at a DM’s disposal. Employing randomness is a great way to maximize the return on your effort, create new game situations on the fly, and ensure that the players can never truly surprise you. 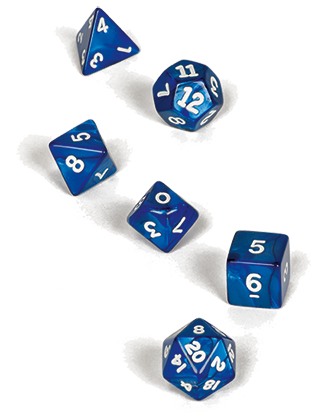 The heart of effective randomness for a DM is to create tables you can roll on to answer questions during a game session, fill in details as you need them, or provide a quick blast of content when the players dart off into a random direction. A few years ago, I ran a short campaign set in Waterdeep. Since I expected the characters to spend a lot of time in various bars, taverns, and other dens of vice, I needed an easy way to fill out the roster of barflies and lowlifes they might run into. And what I realized is that it’s a lot easier to come up with six adjectives to describe characters you might find in a sleazy bar than to stat up six specific nonplayer characters, especially if the adventurers won’t interact with those NPCs for long. Here’s a table I used to randomly create the patrons of a gaming parlor the adventurers visited. If the characters wanted to interact with someone other than the key NPCs I had created, I could build an NPC with four quick die rolls—one for each column on the table. By setting up a similar second table, I could just as easily create the gambling hall’s employees. The strength of these tables comes from the fact that until the characters talk to a random patron or employee, I don’t need to spend any precious brainpower thinking about the NPC. This allows me to spend my prep time creating the hall’s owner, the bouncer, and the pit boss (the guy in charge of watching the dealers)—the key NPCs that I know the adventurers will interact with. Creating tables can save a lot of time, but it helps to have an idea of what you want to do with your tables and the effects you can achieve with them. The specific contents of a table determine its utility. If you fill a table with dull and uninspiring items, the table will produce dull results. Recycle: Note my clever laziness in creating the tables above, where I reused the columns for race and gender. Once you have a few tables, it’s easy to go back and mine them for useful adjectives and ideas. Also, since the employees weren’t that important to the scenario, they got fewer columns. In the game, I expected the adventurers to deal with the pit boss, the bouncer, and the owner, which is why I detailed those NPCs beforehand. Fully fleshed-out dealers and other employees would have competed with my established NPCs in the story, so why put more energy into them? Go For Extremes: Use traits that will stand out for the players. You might notice that in the first table, there’s no option for an NPC who is breaking even. The extremes stand out, so don’t have an entry for a quiet NPC. Instead, create entries that yield up characters who are mute, characters who shout a lot, or characters who speak only rare languages that the adventurers might not know. This method makes tables easier to build because it allows you to think in terms of creating opposite pairs—for example, the big winner versus the big loser in the first table above. Avoid the Bland: Here’s a good example of a mistake—in the second table, I have “Quiet, wants to keep the game going.” That’s not a great entry, since it has the potential to stop the interaction and make the adventurers move on. There’s no point to an NPC who says nothing beyond, “Go talk to someone else. I’m boring!” When you spot features like this in your tables, revamp them to make them more interesting. Action: Try to seed your tables with traits and ideas that prompt action in your game. In both tables above, notice how the final column gives a simple personality trait and a description of how the NPC acts. In the heat of the moment, you know how to portray the NPC to get things moving. Once everyone starts roleplaying the interaction, that initial sense of how the NPC acts can drive things from there. Bend, Fold, and Mutilate: Don’t allow random tables to dictate the adventure. Always remember that a table serves you and not the other way around. If an idea for a cool NPC pops into your head, just use it. Random tables should inspire your creativity, not replace it. Columns, Not Rows: If you find yourself creating larger tables, try to keep them wider than they are deep. Each column of a table represents a broad type of attribute, while each row represents specific attributes within those types. It’s often harder to come up with lots of different specific attributes. For example, the number of potential races for your NPCs is usually low, and it’s much easier to come up with six distinct motivations for a soldier in the town guard rather than twenty. In my experience, the first few specific attributes are easy to generate, but once you need more than ten or twelve, you start to struggle for ideas. More importantly, a table with more columns than rows actually gives you more options. For example, a table with six columns and six rows has the same number of entries as a table with three columns and twelve rows. But the first table gives you 46,656 possible combinations compared to the second table’s 1,728 possible results. At the same time, creating a smaller number of rows for each table means that there’s a better chance you’ll actually use a specific entry you created. That’s intelligent laziness in a nutshell: maximize the return on the work you do! Take Notes: If you use a table to create a creature, location, or some other aspect of the game that is persistent, keep track of it. For example, when you create a random NPC, note the results, the character’s location, and so forth. Soon enough, you might have an entire city’s worth of NPCs at your disposal, each represented by a quick assortment of characteristics. Keep it Fresh: Avoid using the same tables over and over again, and don’t be afraid to create new tables by carving up your old ones. Swap individual table columns around, create new columns as needed, and rotate out specific elements that you’ve used a few times. Don’t let your tables sit around long enough to start generating results that look too familiar to the players. Combat is a central component of the fun of D&D, and it’s even more interesting if you can present vivid descriptions of each spell and sword blow. During the course of a fight, the monsters and characters might make dozens of attacks. That’s a lot of description for a DM to create, especially on the fly, but using tables can help guide you in creating interesting battles. The following tables are fairly simple, but they can help add color to otherwise mundane attacks. To make things more interesting, and to vary your descriptions, try creating tables customized for specific monsters. The following tables work for attacks against zombies and similar undead. To build the tables, I just thought about what an attack against a zombie might look like and wrote down descriptions as table entries. The beauty of this is that you can think about these interesting concepts and descriptions during your prep time. During a game, it can be harder to come up with such ideas without bogging down play. These sorts of tables can also be developed for combat in specific locations, not just against certain types of foes. During a bar brawl, characters might miss on attacks because of drunk patrons stumbling into them. A pool of spilled beer could cause a warrior to slip, or an attack might succeed because a foe is hit and dazed by a thrown tankard at just the right moment. Mike Mearls has always been lazy, and he’s been a Dungeon Master for almost as long.